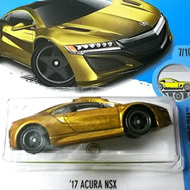 DVC88 is part of the 2017 Super Treasure Hunt set and is 5/10 in the HW Hot Trucks series. The truck is Spectraflame purple with light purple and white stripes on the hood and z-stripes on the sides. The sides also have “TH”, “Hoosier Racing Tire”, and the Hot Wheels logo. 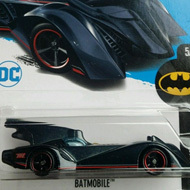 It has clear windows, a chrome interior, Real Rider wheels, and a black plastic Malaysia base. 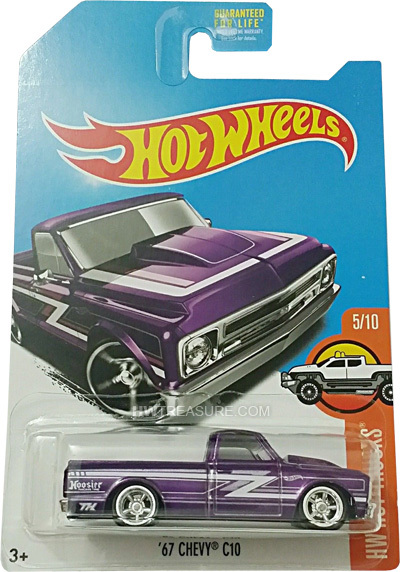 The ’67 Chevy C10 made its debut in the 2013 HW Showroom series. It is based upon the two-wheel drive pickup truck that was manufactured by Chevrolet.